Wishing you a very sweet Hinamatsuri! The snow is finally starting to melt as the first bright rays of sun begin to pierce the clouds warming the cold barren ground. Before the sakura trees (桜, sakura) begin to blossom, another tree—peach tree—is beginning to paint the streets in its brilliant soft pink hues. This wonderful sweet floral smell in the air and the warm gusts of wind mark the beginning of spring and the end to the cold winter months. It’s no wonder that March, this gentle month of transformation and rebirth, is observed as the celebration of femininity. Known as Women’s History Month in the West, concurrent with the International Women’s Day, March 8th, it is also home to the 桃の節句 (momo-no-sekku, peach festival) celebrated on March 3rd and known in Japan as 雛祭り(Hina-matsuri, doll festival). Photo by TANAKA Juuyoh (田中十洋). Momo-no-sekku is one of the five 節句 (sekku), seasonal festivals, known as 五節句 (gosekku, five festivals)—influenced by the Chinese philosophy and first observed during the Heian era (平安時代, Heian jidai; 794 to 1185). Each sekku would fall on the day number corresponding to the number of the month, following the odd number pattern which is considered to be highly auspicious: first day of the first month (January 1st), third day of the third month (March 3rd), May 5th, July 7th and September 9th. 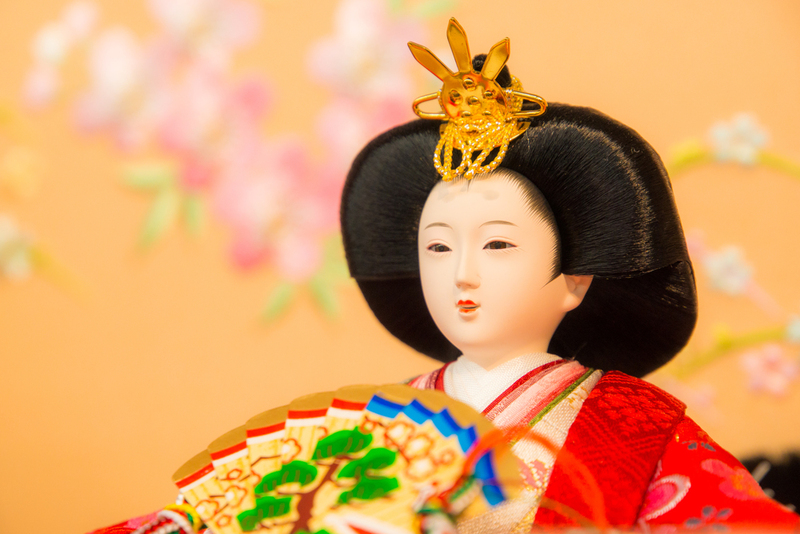 Today commonly known as Hinamatsuri, or the doll festival, also Girls’ Day, momo-no-sekku is a day celebrating young girls, praying for their happiness and healthy growth. During the days leading up to the holiday, starting around mid-February, families decorate their house by setting up an elaborate display of traditional 雛人形 (hina-ningyou, ornamental dolls) dressed in traditional court attire of the Heian era. The setup consists of a platform with either one, three, five or seven steps, covered in a red carpet and an elaborate set of hina dolls assembled in a very particular order. The top tier is occupied by the 内裏雛 (dairi-bina), the Emperor and the Empress. A miniature gilded folding screen, 屏風 (byoubu), is placed behind the royalty to resemble the imperial throne of the time. The second tier is then occupied by the three court ladies, 三人官女 (sannin-kanjo), with the third by the five male court musicians, 五人囃子 (gonin-bayashi), the fourth by a minister of the right, 右大臣 (udaijin), and a minister of the left, 左大臣 (sadaijin), on either side of trays of food, and the fifth by the royal guards, 衛士 (eji), flanked by a mandarin orange tree of the left, 右近の橘 (ukon-no-tachibana) and sakura tree of the right, 左近の桜 (sakon-no-sakura). The more elaborate displays of the remaining levels are decorated with the interior items used in the ancient palace at the time. Celebrated throughout the entire country, the display assortments and the order of the dolls from the left to right vary from region to region. The tier doll placement, however, remains the same. In addition to the dolls, the seasonal peach flowers are another essential decoration as they are believed to ward off malevolent spirits, and invite good luck into the home. Odairisama Doll Set from 工房天祥 on Rakuten. Customarily, the hina dolls are only displayed in homes with young girls. A hina doll set has become a traditional family gift to the little girls bought or passed down from generation to generation by parents or grandparents on the girl’s very first Hinamatsuri, or 初節供 (hatsu-zekku, baby’s first annual festival). These sets however can be very expensive, and living in small houses, many modern families opt out for a 親王飾り (shinnou-kazari) set featuring only the royal couple, お内裏様 (odairi-sama). The set, despite being on a smaller scale, can still go from $300 to $1,000! These doll displays are kept until the festival, March 3rd, and taken down strictly thereafter. Keeping the dolls up past the date is bad superstition, believed to result in late marriage for the daughter. Big Katsuura Hinamatsuri. Photo by Cookie M.
If you are passing by the Tokushima prefecture, stop by the Katsuura town and check out their annual doll festival—the largest in the country. Boasting displays consisting of 30,000 dolls, it is a sight to be seen! So when did the doll displaying tradition begin? The custom began almost a millennium ago in the Heian period. Influenced by the ancient Chinese belief that sin and misfortune can be transferred to a doll, the tradition called for the straw dolls at the end of the festival to be set afloat in boats down a river. It was believed that the dolls would carry the bad fortune away with them. In some regions in Japan this ancient custom is still practiced today, known as 雛送り(hina-okuri), 流し雛 (nagashi-bina), or 雛流し (hina-nagashi). Tsurushi-bina. Photo by captain tirol. 吊るし雛 (tsurushi-bina) is another Hinamatsuri decorative alternative, consisting of a variety of dolls hand-crafted from tiny pieces of kimono material hanging from the ceiling or specially designed stands. The practice began in the Edo era (江戸時代, Edo jidai, between 1603 and 1868), when celebration of the Hinamatsuri became a widespread phenomenon. The hina dolls were not an affordable item at the time, so common people began to craft their own versions of the dolls. These dolls come in many shapes and sizes, and today accompany the hina doll set display as an additional decorative piece. Sakuramochi. Photo by Yuichi Sakuraba. The Hinamatsuri is also celebrated with an array of delectable traditional foods and sweets. The traditional Japanese sweets or 和菓子 (wagashi), catered to the pallet of the young, are often prepared in a colour palette of whites (purification), greens (health) and pinks or reds (to ward off the evil spirits). These are 菱餅 (hishi-mochi)—three-tier diamond shaped rice cakes (one in each colour), 雛あられ (hina-arare)—bite-sized, sweet, pastel-colored rice crackers, and 桜餅 (sakura-mochi)—bean paste filled rice cake wrapped in edible sakura leaves. These sakura leaves are only edible during the Hinamatsuri season as opposed to the 花見 (Hanami, sakura tree viewing) season, as one might think. The main dishes included the colourful and playful ちらし寿司 (chirashi-zushi) and 潮汁 (ushiojiru)—salt-based soup with clam shells. The clam shells are symbolic of a united couple, prepared in hopes that the daughter of the house will find herself in a good marriage in the future. If you are in the mood to celebrate the festival or simply to sample any of these dishes, head over to your nearest Japanese supermarket, or better yet try making them yourself with this JustOneCookbook.com Japanese recipe blog featuring all these dishes and many more! Wishing you an amazing spring festival, and the warmer days to come!